Luke 10:25-37-A lawyer (scribe) tries to test (trick) Jesus by asking, “What shall I do to inherit eternal life?”. (Ryrie) “Scribes, who belonged mainly to the party of the Pharisees, functioned as members of a highly honored profession. They were professional students and defenders of the law (scriptural and traditional), gathering around them pupils whom they instructed in the law. They were also referred to as lawyers because they were entrusted with the administration of the law as judges in the Sanhedrin (cf. Matt. 22:35).” Since he is an expert in the Law, Jesus questions him about what the Law says concerning this matter. He responds with Deut. 6:5. Jesus tells him that he is correct. But then, the man tries to “justify himself”. Perhaps, even as he quoted the Law, he realized that he wasn’t personally doing what he had just said was necessary, so he tries to create a loophole by defining his “neighbor” as being the one who loved him, not the one who needed to be loved by him. In response, Jesus then tells the Parable of the Good Samaritan. It is a story about a man who was on a trip from Jerusalem to Jericho. Today, it takes about 6½ hours (not including breaks due to the heat, etc.) to cover the distance of 15 miles (24 km) with an elevation decrease of about 3400 feet (1060 m). Jesus traveled this route many times. In fact, every time that he came to Jerusalem from Galilee, he would have traveled up the same Ascent of Adumim…the gorge where the ascent is going up to Jerusalem from Jericho (unless permitted to travel through Samaria; cf. John 4 and Luke 9:52-53). Scriptures record at least one trip of Jesus through Samaria and two trips by way of Jericho. He possibly traveled this road dozens of times in his life. This is probably the road his parents had to climb back up to Jerusalem after realizing that their twelve-year-old boy wasn’t in their caravan (Luke 2:41-50). It was a very treacherous road with many nooks, crannies, and turns where thieves could hide…and consequently had a notorious reputation for being a dangerous place to travel, especially alone. 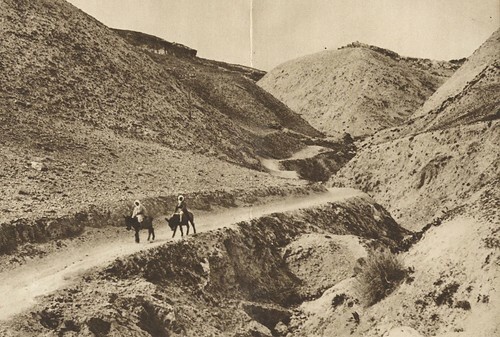 The top photo is an old picture of the road leading from Jerusalem to Jericho. In the second photo, the road is seen near the bottom of the gorge on the bottom left-hand-side. Jesus says that a “man”, but doesn’t identify what kind of a man was making this journey. Along the way he was attacked by robbers who stole his clothes, beat him up, and left him “half dead”…apparently they didn’t kill him, then they would be guilty of murder. They just killed him halfway and probably intended to let the exposure to the elements and wild animals do the rest. After some time, a Priest came down the road. But the Priest went by without providing any help, because the man wasn’t a Priest. Then, a Levite came by. But the Levite went by without helping him because the man wasn’t a Levite. Both of them “saw him”, they recognized that he was in trouble but did nothing. Then, a “Samaritan” came by. (Ryrie) “Samaritans were descendants of colonists whom the Assyrian kings planted in Palestine after the fall of the Northern Kingdom in 721 B.C. They were despised by the Jews because of their mixed Gentile blood and their different worship, which centered at Mt. Gerizim (John 4:20-22).” The Samaritan “saw him” and “felt compassion” and helped him. Notice the extent that the Samaritan went to in order to help this man: 1.-he stopped, instead of passing him by…this in itself was potentially dangerous since it could have been a trap set by thieves; 2.-he bandaged up his wounds…using his own supplies; 3.-he put him on his own beast…now he was inconvenienced because he would have to walk; 4.-he took him to an inn where he personally took care of him; 5.-he left instructions and payment with the innkeeper to continue taking care of him; 6.-he told the innkeeper that if the expenses exceeded what he had given him, then when he came by next time he would pay him the difference. It seems that Jesus was intentionally going to quite length to make the distinction between the responses of the Priest, Levite, and Samaritan, so that there would be no mistaking the point He was about to make. Jesus then teaches the scribe that your neighbor is simply the person who is in need, there is nothing that limits who your neighbor is. The man was trying to define love by showing its limitations (who it was to be expressed to), but Jesus was defining love by showing its application (how it was to be expressed). The man was asking the wrong question, on purpose…in order to defend his wrong attitude. You can often ask the wrong question…in order to get the answer that you want and appear to be right. The question was not “who to love” (we should love everyone), but “how to love”. Luke 10:38-42-Jesus arrives at the home of Mary and Martha (“a certain village” was Bethany, John 12:1). He meets Martha (the worker-“distracted”), and Mary (the listener). Martha complained to Jesus that Mary wasn’t helping. Jesus tells Martha that she needs to realize what is really important, what her real priorities should be. Prayer: Lord, there is so much here. Please help me to love others based on Your love (Who You are), not on who they are. And Lord, please keep me from becoming caught up in all of the work, no matter how important it is, and not keeping my focus on You. Lord, there are so many things (good and bad) in my life…that demand my attention. Please help me to never allow them to distract me from You.